construct roads, streets, parking lots, sidewalks, curbs and more. Creates straight-edged "forms" for paving, even on curves. 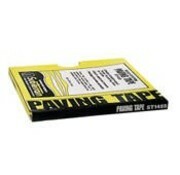 White foam tape with removeable backing. One Package of Paving Tape.